On April 30th, 2010, a benefit concert called Big Love took place at the Belly Up Tavern in the northern San Diego County enclave of Solana Beach, CA. The proceeds for this event went to help offset some of the financial hardships incurred due to singer Candye Kane’s ongoing battle with pancreatic cancer. According to the event’s organizer and producer, Michael Kinsman, the evening raised $25,000. 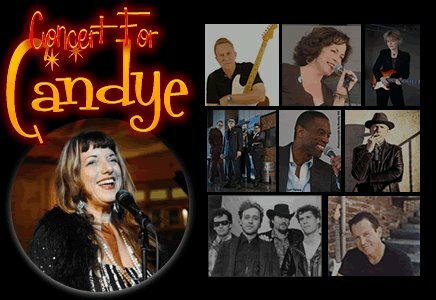 Almost immediately after the April 30th Big Love benefit concert press release appeared in this ezine in March, a second Southern California benefit for Candye was announced and was then scheduled to take place on April 29th. One of the principal organizers of this second show told me that this event raised an additional “Just under $5,000 ” that went towards the cause. 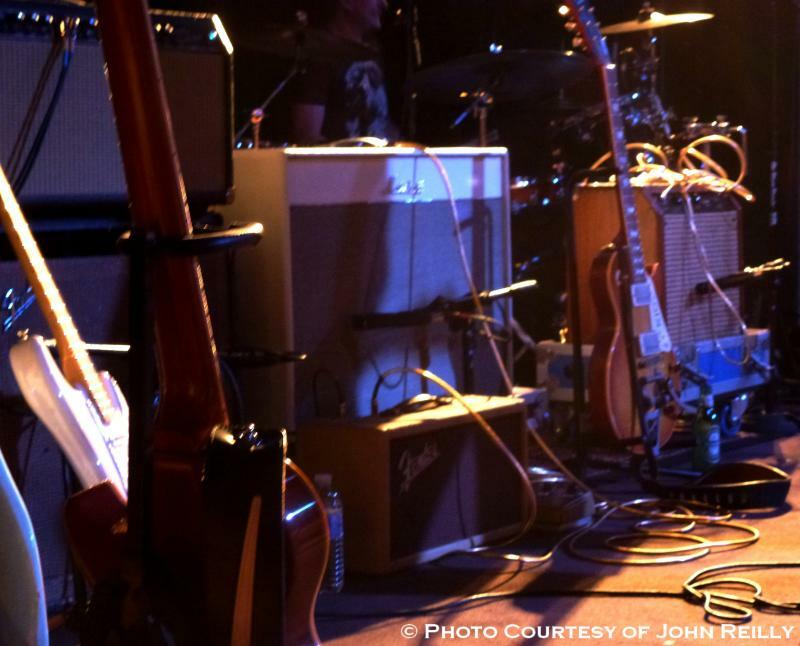 The show at the venerable beach city venue, the Belly up Tavern turned out to be a very special evening of music. As the line began forming two hours before show time and eventually wrapped around the building it was clear that the audience was aware that this would be no ordinary concert. It wasn’t. The evening of music began with the extremely talented and creative San Diego area based harmonica player, vocalist and songwriter Billy Watson. Watson who is a true original was backed by backed by current and former members of Candye’s band including bassists Thomas Yearsley and Kennan Shaw, guitarists Laura Chavez and Steve Wilcox, Candye’s son, drummer Evan Caleb Yearsley and the prolific baritone saxophonist Johnny Viau. Watson and company were then joined by San Diego based vocalists Michelle Lundeen and Ruby who each sang a tune. The legendary Beat Farmers performed a brief and enthusiastically received set featuring their own concoction of blues based, roots music with a splash of rockabilly and just a twist of country. Next up to bat was a man who needed no introduction and didn’t get one. Standing alone on stage with a Les Paul in hand and songs in his head was Jack Tempchin. He did a new original tune that until Sunday evening few had ever heard but won’t soon forget. Then Tempchin did one of his own compositions that everyone had heard of but are not allowed to forget, Peaceful Easy Feeling. The tune appeared on the Eagles debut album 40 years ago and is still on heavy rotation on every oldies and classic rock station in America. Candye Kane has included at least one tune written by Temphchin on almost every album she has released. Rick Estrin and the Nightcats then took the stage and did a brief set that included Estrin reading a lengthy and heartfelt message from Candye delivered to Michael Kinsman via his iPhone. Estrin would remain on stage for the rest of the night as the program’s very capable Master of Ceremonies. His Nightcats would back up several acts. 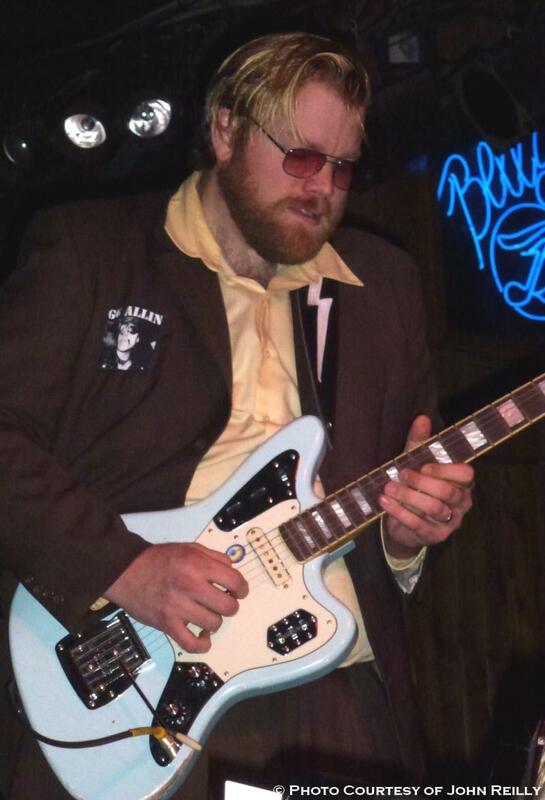 The Nighcats are guitarist Chris “The Kid” Andersen ,who has emerged as a star in his own right, organist as well as bass player Lorenzo Farrell and drummer J. Hansen. 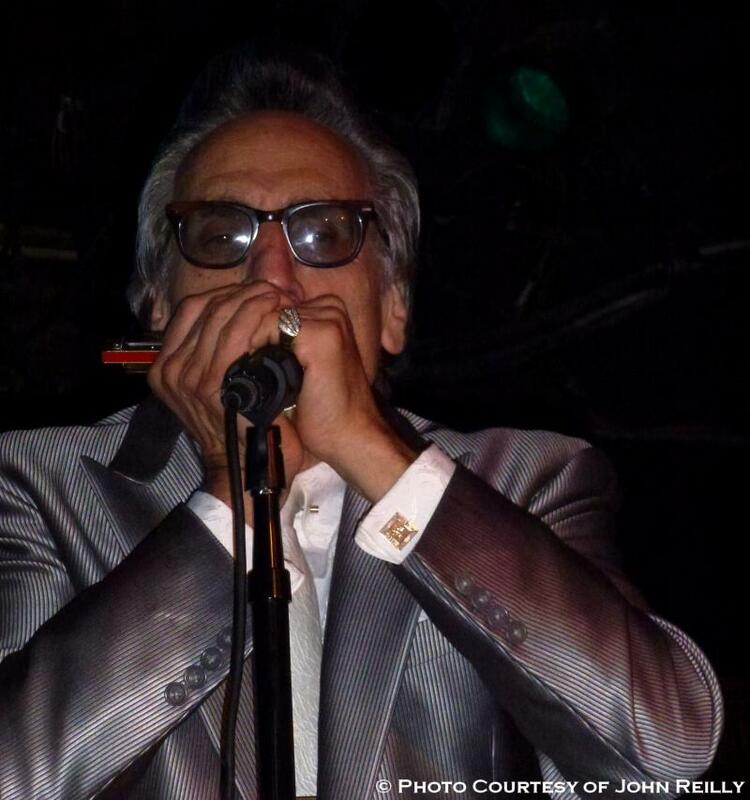 Rick Estrin and the Nightcats set the tone of deep soulful straight ahead blues that would also be the staple of the next three acts to take the stage. The very talented veteran blues guitarist Debbie Davies then made her way to the bandstand. She delivered the goods and received sympathetic backing by Estrin and his Nightcats. Singer and harp player Kim Wilson was next up on the bandstand and he was accompanied by the San Diego based rhythm section of bassist Scottie Blinn and drummer Al Schneider. 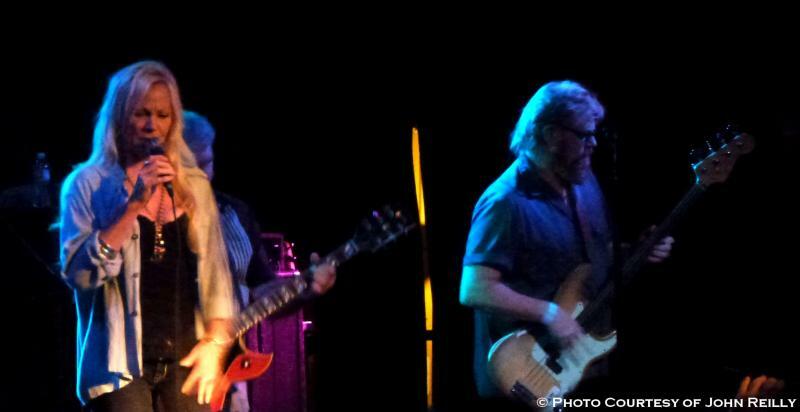 Wilson was also joined by the legendary bass player Larry “The Mole” Taylor who on this evening played guitar as well. Taylor spent a great deal of time utilizing a bottleneck slide which was the perfect foil for this time slot’s main attraction, Anson Funderburgh. Funderburgh handpicked the band he wanted to play with for this gig. His choice for pianist couldn’t have been much better as the great Carl “Sonny” Leyland is on the short list of the best blues pianists in the world. Leland had played extensively with Funderburgh twenty years ago and also played with Janiva Magness frequently just a few years later when the pianist was based in Orange, CA. The quartet of Wilson, Taylor, Funderburgh and Leyland on the same stage represented blues music at its very finest. At one point in the proceedings Taylor switched up and played bass, raising the bar even higher. The person who, along with Michael Kinsman, was largely responsible for this benefit, Janiva Magness was next up on the bandstand. At this time Hansen and Farrell from the Nightcats again anchored the rhythm section. Guitarist Chris “The Kid” Andersen was back in the mix and much to the obvious delight of Magness, Funderburgh remained on the stage. She left room for Anson to solo on several occasions. Funderburgh was true to form as he delivered every time and never over stayed his welcome. Magness, who is a dynamic singer and band leader, is also fan. She was genuinely thrilled to share the stage with Funderburgh. Tommy Castro should be commended for giving up his time and talent for the cause. The astonishingly popular singer and guitarist’s brand of over amplified, funk–rock guitar histrionics however, was not a hit with this particular audience. Moments after he took the stage several people around me headed for the exits. Others desperately stuffed paper napkins or simply cupped their hands over their ears and tried to wait him out. By the time Castro left the stage, three quarters of the audience had left the building and were on their way home. Patience has its own rewards and for those who stayed their redemption was Dave Alvin, the evening’s headliner. Alvin is one of the true geniuses of American roots music. He was backed by his band the Guilty Ones. They are Chris Miller on slide guitar, bassist Brad Fordham and drummer Lisa Pankratz. Dave opened with a song from his latest album Eleven Eleven, Harlan County Line, and launched into the anthemic Fourth of July that he dedicated to Candye Kane. Alvin pointed out he had known Candye for about thirty years. He acknowledged that every time he picked up the phone and it was Candye on the other line he knew he would feel better for the experience and added he would always learn something as well. Dave then introduced a man with whose life and legacy he will always be associated, his older brother Phil. Phil Alvin then sang two songs that will appear on the Blasters’ upcoming June, 2012, Rip Cat Records release. He sang long time Blaster favorite and James Brown classic, Please, Please, Please. Apparently due to Phil’s recent knee surgery the cape routine had to be scrapped. The next tune the brothers Alvin launched into was the Dave penned rocker Marie, Marie. As is his want, Phil sang the song in Spanish. Dave ended his slot appropriately enough by playing an instrumental version of his old Blasters’ tune So Long Baby, Bye Bye. The show came to a climax with Janiva Magness, who led the Big Love All Star Blues Band that included Anson Funderburgh, Debbie Davies, Tommy Castro, Larry Taylor and Chris Andersen on guitars along with Rick Estrin and Kim Wilson on harmonicas. Magness then yielded the stage to a rousing ovation as the band shuffled on for several more minutes giving the crowd just a few more moments of bliss. Given the gravity of Candye’s health issues, it was a wonderful cathartic moment for the musicians and fans alike. With the sheer amount of talent and different musical amalgamations, it was simply astounding as to how smoothly the program was managed. Much of the credit for the near seamless production goes to Scottie Blinn who acted as stage manager. 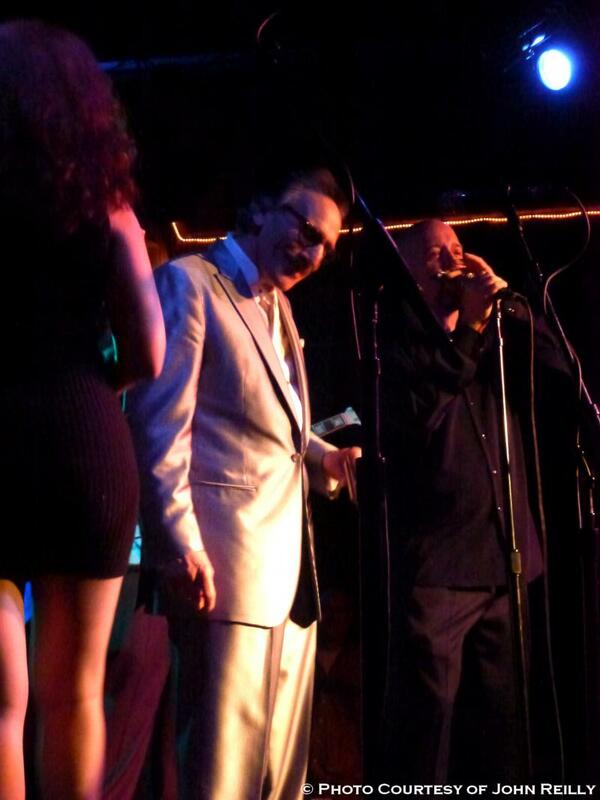 Rick Estrin was, as you might suspect, the consummate pro behind the mic as the Master of Ceremonies. The staff at the Belly Up Tavern were on their “A” game as well and did an outstanding handling the overflow crowd on a Monday night. The service was first rate. Two days after the show, I spoke to the benefits producer Michael Kinsman. He worked tirelessly for over three months to put the program together. He told me that he had put a tremendous amount of time and effort into the event and that he was very gratified that the show was a success on every level. He went on to say that it exceeded his expectations in every way. His hard work, professionalism and attention to detail paid off as it was an unforgettable evening of music and good Karma. Kinsman is an extremely gifted writer and blues ombudsman. The evening was special on several levels but what made this event unique was that the musicians who shared their gifts with us were for for the most part made up of Candye’s close personal friends. I think it was what helped give the evening a warmth and spirit of which the likes I can’t recall. As I write this, Candye has just completed her surgery and is recuperating. She remains in our thoughts and prayers. Also note: There are features about Candye Kane, Michael Kinsman, Anson Funderburgh and Dave Alvin in the archive section of this website. 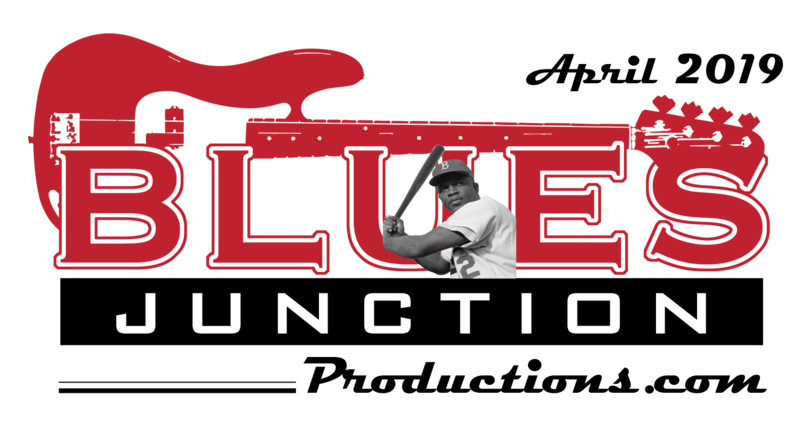 Additionally, Candye’s bassist Kennan Shaw is an ongoing contributor to BLUES JUNCTION. He has several essays which can be found in this ezine’s archives as well.